needed to stay focused on her plan—a plan Simon was not entirely privy to. “Well, he’s interested in Mrs.
Leighton. After I lure him in, I can spend time with him not as a wife, but as a woman. Then I shall be able to satisfy my curiosity regarding my husband,” she lied. They had procured a few local servants upon their arrival, and no one suspected the renters were not who they claimed. As far as the servants were concerned, the trio included a wealthy English lord traveling with his mistress and her companion. Julia, Simon, and her aunt, Theodora, took great pains to maintain the illusion, unless absolutely certain they were alone. Once inside, Simon removed her cloak and handed it to the footman. Aunt Theo appeared in the parlor doorway. “Would either of you care for a sherry?” Judging by the messy riot of curls on Theo’s head, Julia guessed her aunt was already on her second or third drink. “Yes, I believe I shall. Darling?” She gave Simon a seductive smile for the benefit of the servant hovering nearby. “Lead on, my love,” he said easily, gesturing to the doorway. “And how was your evening?” Theo asked as she settled her rounded, lush frame on the divan. Her aunt was fond of sherry and cake and hardly a day went by when she didn’t indulge in at least one. “Productive,” Julia answered, closing the door behind her. “Simon, bring me a glass of whatever you’re having. Sherry makes me gag.” She dropped into a chair opposite her aunt. “Have you met her?” Julia asked him. “I almost pity that poor husband of yours,” Simon drawled. Julia frowned. Colton deserved no pity. The man was a reprobate. And he’d left her at the mercy of his cheating, lecherous relative. “Not long. If I were to wager, not long at all,” Julia answered with a sly smile. Simon gave them an elaborate bow and left. “Do you think this scheme will work?” Theo asked once they were alone. “It must. Templeton’s last visit continues to give me nightmares.” After informing her—again—of the further reduction of her monthly stipend, the grotesque excuse for a man had suggested what services Julia could provide to make up the difference. And by services, he hadn’t meant mending his clothes. They both fell silent, contemplating the duke’s reaction to such a letter, while the mantel clock ticked loud and steady throughout the room. “Will Colton acknowledge the child, I wonder?” her aunt asked, and sipped her sherry. 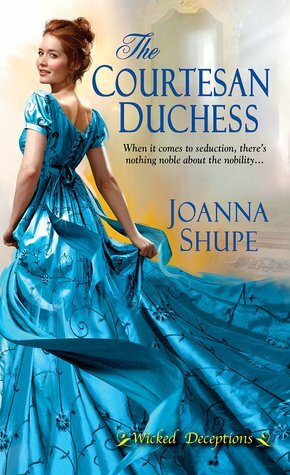 Thank you for hosting THE COURTESAN DUCHESS! I need to read this book! Thanks for sharing, ladies!